Which Foods Contain Monounsaturated Fatty Acids? Are Olives Healthy to Eat? The humble olive, once a supporting character in salads, on pizzas or in a martini, has risen to nutritional super-stardom. 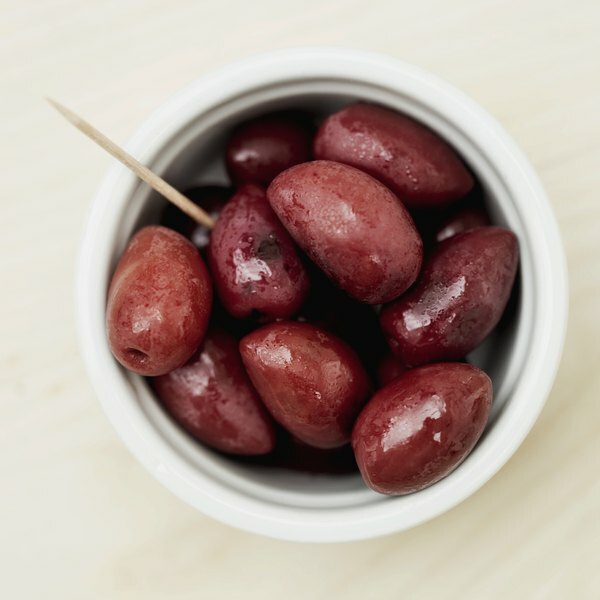 An array of health-boosting olives is available, including ubiquitous black olives, oil-cured Kalamata olives, and Manzanillas -- green Spanish olives often stuffed with pimentos. Olive oil, considered the healthiest oil, is also available in different varieties. In addition to being delicious, the olive has proven health benefits. Eaten since 3,000 BC, olives are one of the oldest foods in the world. They originated in Greece and quickly gained popularity. In addition to eating olives, ancient peoples used olive trees for shelter, fuel and medicine. The olive tree is a symbol of wisdom and peace, and is represented in the Bible, Greek mythology and Egyptian art. Olives and olive oil are a rich source of healthy monounsaturated fats. Healthy fats are essential to your good health, and should contribute approximately 30 percent of the calories to your diet. Monounsaturated fats -- also found in canola oil, avocados, almonds, hazelnuts, and pumpkin and sesame seeds -- lowers harmful LDL cholesterol, raises beneficial HDL cholesterol and prevents heart disease and stroke, according to the American Heart Association. On average, a half-cup of olives contains 77 calories, 4 g of carbohydrates, 7 g of fat and zero cholesterol. Olives and olive oil reduce inflammation, a culprit blamed for chronic diseases such as arthritis, type 2 diabetes and heart disease. A compound in olives called oleocanthal prevents the body from making inflammatory enzymes -- the same way non-steroidal anti-inflammatory drugs work, according to "Arthritis Today." As a result, pain and sensitivity may diminish. Strongly-flavored olive oils, like those from Tuscany, have the highest level of oleocanthals. Olives and their oil are a key component of the Mediterranean diet, which is considered among the world's healthiest. It protects against heart disease and other chronic illnesses, according to Harvard Women's Health Watch. The Mediterranean diet is high in healthy fats, mainly from fish and olive oil. Foods from plants -- vegetables, beans, fruits, grains, nuts and seeds -- are the main foods upon which meals are based. Animal protein, mostly fish and poultry, are added in lesser amounts. Red wine is typically drunk with a meal, and red meats and sweets are used sparingly. Several different grades of olive oil are available. The flavor can vary, like wine, depending not only on where the oil is produced -- Italy, Spain, Morocco, Tunisia, France, Greece or California -- but also on the type of olive used, soil condition and weather, OChef explains. Olive oil is pressed from ripe olives. Oil from the first pressing is called extra-virgin olive oil, typically fruity with a strong flavor. It is considered the finest, and is best used on salads, in marinades and served with bread for dipping, since it can develop a bitter flavor in high-heat cooking. Oils labeled pure olive oil, or just olive oil, can be used for cooking. OChef: Which Olive Oil Is Which? What Vitamins & Minerals Do Olives Have?